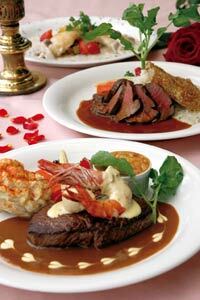 Sam’s Restaurants chain is making Valentine’s a special occasion at all its Okinawa restaurants. Each of the Sam’s restaurants across the island, including Sam’s Café, Maui Steak House, and Sam’s Anchor Inn, is offering Valentine’s specials through Friday, February 15th. Sam’s By the Sea, voted best romantic restaurant by readers in a newspaper poll, is offering three entrees at its Awase and Naha Oroku restaurants. Patrons can choose from Seabass with French Ratatouille for ¥2,250, Tenderloin Steak Madeira for ¥2,800, or a combo featuring Macadamia Crusted Mahi Mahi and roast tenderloin steak for ¥2,900.